“We’re still here! We’re still here! 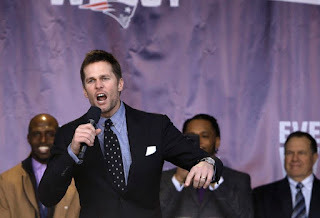 We’re still here!” was the Tom Brady-led rallying cry in front of 35,000 fans at Gillette Stadium yesterday. The New England Patriots departed for Atlanta ahead of Super Bowl LIII in front of one of the biggest sendoffs they’ve ever had. The large turnout can be contributed to the decision to depart on a Sunday as opposed to last year’s Monday rally. Owners Robert and Jonathan Kraft thanked the crowd for their ongoing support throughout the years as this year is the 25th anniversary of their purchase of the team. Belichick and team captains James White, David Andrews, Matthew Slater, Patrick Chung, Devin McCourty and Tom Brady all spoke at the rally to fire up the fans before the big sendoff. The Patriots will take on the Los Angeles Rams in Super Bowl LIII on Sunday, Feb. 3.